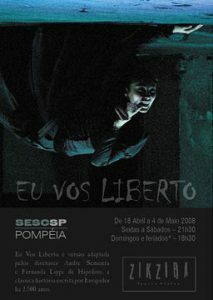 Eu vos liberto (I set you free), inspired by Euripides’ ‘Hippolytus’, captured for TV by Maverick Motion Brasil, features an award-winning international cast of dancers and actors. The full-length performance by Zikzira Physical Theatre examines desire, fear of the female and misogynistic contempt. Seemingly polar opposites, the characters are aspects of the same, linked through flashes of illusory power and fatal hubris. This production examined the play’s archetypical mechanisms and its subtler qualities of forgiveness and transcendence. Here, the characters are discarnate. Dream-like, in state of limbo, they are etheric imprints of their carnal counterparts and bound to their choices. "Ravishing imagery in a fusion of dance, theatre"
"Zikzira's reexamination of Eurípides' classic tragedy Hippolytus, through spheres of light and darkness - is quintessentially contemporary."